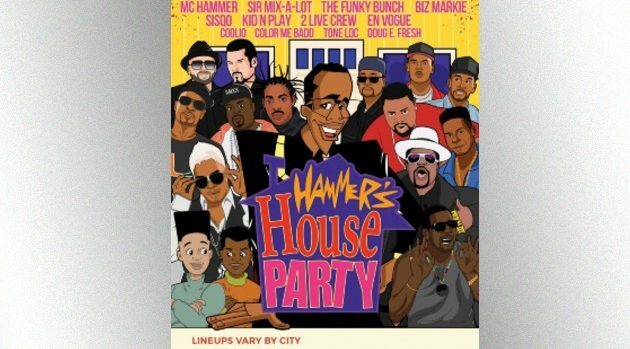 MC Hammer will kick off his first major tour since 1991 starting April 6 in Tallahassee, FL, and he’s bring a lot of friends with him. The lineup will be changing from city to city, but the artists who’ll be participating include En Vogue, Sir Mix-a-Lot, Kid ‘n Play, Sisqo, Doug E Fresh, Tone Loc, Montell Jordan, Tag Team, Rob Base, Young MC, DJ Kool, Biz Markie, Coolio, The Funky Bunch, 2 Live Crew, Color Me Badd and more. Some dates are on sale already, other dates will go on sale this Friday, but for full ticketing updates, visit HammersHouseParty.com. MC Hammer VIP and meet & greet packages will be available at Future-Beat.com.